The joy of having children is balanced by the heft of responsibility parenthood entails. There are many ways in which parenthood affects parents, and one of the most significant is in terms of finances. It costs money to raise children, and it is difficult to know just how much money it is going to cost to raise a child. As a result, many parents, including relatively wealthy ones, find themselves in differing levels of financial stress as a result of their financial responsibility to their children. Of course, parenthood has its stages, and one of those stages is when the children are no longer at home. Suddenly, with no dependent children to pay for, parents find themselves with some extra funds previously spent on raising their children, and they want to invest those funds. In the Spectrem Perspective Family Affair: How Children Change Your Financial Decision-Making, research segmenting investors by whether they currently have dependent children or have children who are no longer tax deductible shows the wide-ranging effects children have on investing behaviors. Having dependent children does not take money away from parent investors, but it raises concerns about the assets they have today and how much they will have for tomorrow. It is not until the children leave the home as adults that many investors can have a more secure sense of their wealth. For instance, among Millionaire investors with a net worth between $1 million and $5 million (not including primary residence), 81 percent of those without dependent children fully expect to have sufficient income to live comfortably during retirement. 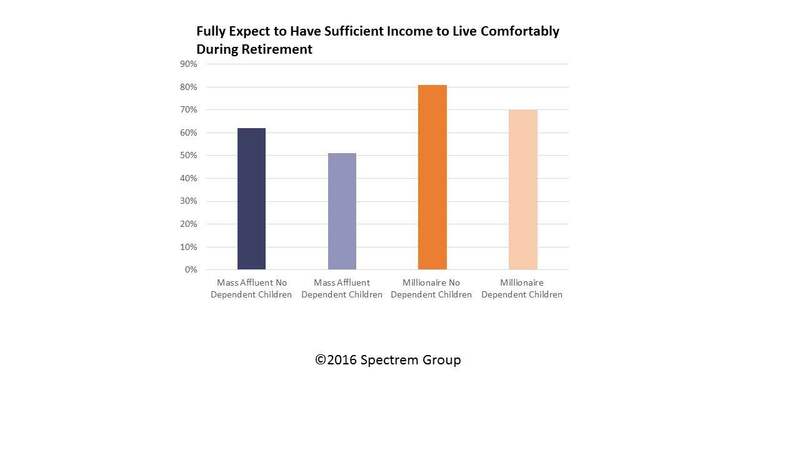 Only 70 percent of those with dependent children are confident in their retirement income level. Among Mass Affluent investors with a net worth between $100,000 and $1 million (NIPR), 62 percent of those without dependent children feel they are set financially through retirement while just over half (51 percent) of those with dependent children feel the same way. Conversely, while 14 percent of all investors feel they are not saving enough to meet their financial goals, 37 percent of Mass Affluent and 27 percent of Millionaires with dependent children are concerned about their savings performance. Clearly, this research roughly parallels similar research related to age and financial security, as younger investors are more likely to have dependent children. They are also the ones most likely to question their financial situation, as are those who are less wealthy. Another component to raising children or having dependent children at home is the possibility of debt. According to the Spectrem research, more than 30 percent of Mass Affluent investors with dependent children and almost 20 percent of Millionaires with dependent children are concerned about the amount of debt they carry. The percentages for those without dependent children are 12-14 percent lower. The other reality about having children is that while they tend to become more expensive over time (clothing, activities and schooling all cost more as children get older), investors with children tend to get a better grip on their expenses at the same time. That is perhaps why Millionaire investors with dependent children were more optimistic about seeing improvements in their financial situation in the year to come (58 percent compared to 43 percent among Millionaires without dependent children). Are your investors with dependent children counting down the days and hours before their children leave the home and become independent? They would not be the first. But advisors must let investors know that the decisions they make today will greatly impact the financial status they will have once they no longer support their children financially. While it may seem like a huge weight is lifted, being released of that financial burden does not in itself create a new level of wealth. The financial burden of having dependent children comes in stages. There are costs related to having young children versus having children in high school, college and after college. The conversation with investors must be ongoing related to the money being spent on children now versus the investments that can have financial benefits down the road. Advisors working with investors with dependent children need to address the two above concerns – retirement income and savings. Suggesting ways to increase retirement income even as children remain in the home certainly can alleviate the first concern. Potential prospects might include those households who are just passing the hurdle of moving their dependent children out of the house. For many, they don’t take the time to focus on their finances until that time. While that is certainly not optimal for the investors, it does highlight a segment of investors who may be seeking assistance.